See our options for temporary chain link fence and panel fence rental. Temporary fence gates and privacy screen are available for construction job sites and special events. 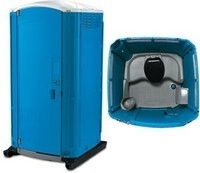 Unmatched selection from basic portable toilets to best-in-class portable toilet Services. Our portable toilets are delivered and serviced with professionalism where and when you need them for special events, construction sites, private use and more.